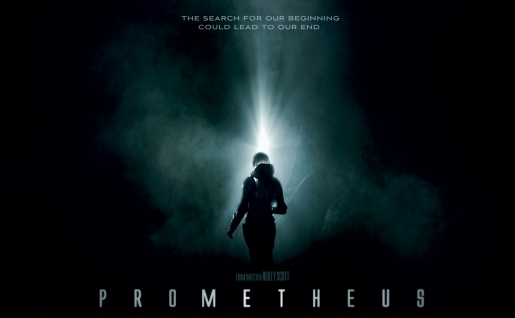 Despite being a prequel to the original Alien, Prometheus is a bold and original piece of sci-fi filmmaking, which received far more criticism than it deserved. In the months since its release the movie has been picked apart with all of the potential plot holes dissected, and while the film does has problems, I can’t help but admire the sheer ambition, and focus on the magnificent achievement Ridley Scott was able to pull off. Here is a prequel which, for once, feels like a necessary part of the story, and never becomes predictable even though we have seen the original, and so technically we know where the story will end up. To see a big summer blockbuster raise questions about God and the origins of the universe is extremely refreshing, and the movie is able to create a great tone of mystery and intrigue that drew me in right from the opening scene. Though it arguably does not answer its own questions in a satisfying way, I like that this is a movie which forces us to think, to draw our own conclusions, to fill in the blanks, while taking us on a ride that I immediately wanted to get right back on. V/H/S is the kind of horror movie I want to see more often. It takes the found footage trend, popular now due to the success of Paranormal Activity, but puts a brilliant twist on it, also functioning as an anthology film. This results is one of the most efficient horror movies of recent years. Where as in a typical film like this, the good scares wouldn’t come until the very end, in V/H/S, because we are actually watching five different stories, we’re constantly getting them, over and over again. Despite being nearly two hours, it never wastes our time, and has so many moments of sheer, pulse pounding terror, to the point where even I, a horror aficionado, was tempted to hold my hands over my eyes. It’s highly flawed in a lot of ways, seeing as not all of the five segments are equally interesting, and like most horror movies, there’s some occasional bad acting and dialogue. But like Prometheus, I’m more willing to forgive these hiccups just for the sheer ambition of trying something like this out. This is the kind of movie which reminds me why I love horror. Moonrise Kingdom is such a sweet, innocent little movie, that it’s easy to underestimate how good it actually is. Perhaps its biggest achievement is in the relationship between the two kids. It doesn’t feel real, necessarily, but within the film’s heightened, storybook universe, it totally works and is absolutely believable within that context. Where as most movies try to depict what it’s like to be a kid, this movie tries to depict what it’s like to think like a kid. The movie is filled with a juvenile sense of reality that, as soon as we’re willing to accept it, gives us a feeling of whimsy and magic which I would compare to a Disney cartoon. It’s consistently funny, but with all of the jokes driven by well-defined characters, not just by random humor, and the supporting roles are all just as wonderful as the leads. This is a movie which you can’t help but smile while watching. Funny how the relationship between two young kids ends up being the most compelling of 2012. There was a lot going against The Dark Knight Rises’success. 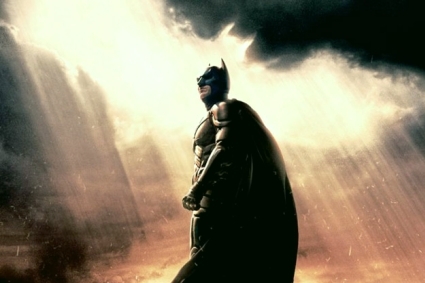 Back in 2008, after the premiere and worldwide acclaim of The Dark Knight, fans were quick to discuss the sequel, but many claimed director Christopher Nolan shouldn’t even return for it. After all, why should he if there was no way he could possibly top himself? And according to Nolan himself, he seriously considered this possibility of not returning. I’m so glad he did, because although The Dark Knight Rises was not able to live up to its immediate predecessor, it still, in my mind, was an utterly captivating and epic conclusion to the trilogy. The film nearly demands a second viewing, because the first hour or so is so different than what we would expect coming off of The Dark Knight, and admittedly I was unsure where the film was headed during this opening. But by the time Bane, the film’s villain, gets his plan underway, I was hooked. Though Heath Ledger’s performance was nothing short of legendary, in some ways Tom Hardy’s Bane actually matches the Joker in terms of sheer intensity, a task nobody could have expected he would pull off. The movie doesn’t work as well as a standalone piece of fiction as The Dark Knight did, but as a conclusion to Nolan’s trilogy, I could hardly imagine it ending any better than this. I’m still waiting for a year when Tarantino puts out a film that doesn’t end up being one of my favorites. 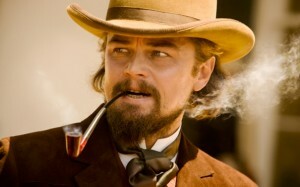 I’m sure it’s inevitable, but 2012 isn’t that year, and Django Unchained isn’t that movie. At this point, I’m tempted to say, “It’s a Tarantino movie,” and end the review there, because the brilliant director’s eight films are all excellent for pretty much the exact same reasons. First and foremost is his excellent dialogue, which is highly stylized but unbelievably entertaining. There’s something about this man’s writing that just continues to draw me back to the theater, to rewatch his movies over and over again. This guy could probably write a movie which was three hours of characters sitting at a table discussing the history of chairs, and I’d be utterly riveted. Django, disappointedly, doesn’t seem to have very much to say about slavery and racism other than “it’s bad,” which is surprising after the director’s brilliant commentary on violence and war in Inglourious Basterds. But that doesn’t stop this western epic from being one of the most memorable movie experiences of the year, and a worthy addition to the legendary director’s lineup of work. 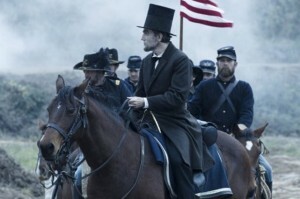 Steven Spielberg’s Lincoln, unexpectedly, was hardly about the man himself. The film could have been an all-encompassing bio-pic covering the his entire presidency from beginning to end, but Spielberg, wisely, focuses in on a specific time in history: the passage of the 13th amendment. And so the movie, in reality, is about the process by which a bill becomes a law. Who would have thought this would be one of the most compelling films of the year? Partially this is due to Daniel Day Lewis’ dynamite lead performance, which is so good that it takes no more than ten minutes before we stop thinking of him as an actor in makeup and a costume. The screenplay by Tony Kushner has a tremendous pace, with a great sense of historical importance mixed with some surprising humor, especially with James Spader’s character. In the end, the film is a portrait of one of the great American presidents, but more than that, a tribute to the way our democracy functions which, despite taking place 150 years ago, feels shockingly relevant today. Paul Thomas Anderson’s The Master, his follow up to the brilliant There Will Be Blood, had to be a disappointment almost by default. After such an unforgettable film as Blood, already in my opinion one of the great American movies, how could Anderson possibly top himself? With The Master, he didn’t top himself, but that doesn’t prevent his film from being one of the most compelling of 2012, a descent into madness which seems designed to provoke and confound its audience by the end, and with some of the most beautiful cinematography in modern times. 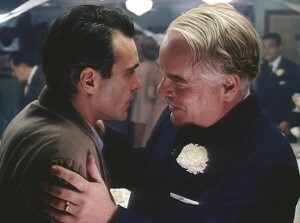 Though the basic plot of the film is a simple story about the fatherly relationship between two men, Anderson is often rather ambiguous about what it all means, allowing us to draw our own conclusions and practically demanding repeat viewings and further analysis. For me, I saw the film as a brilliant reflection on the human need to have someone, a master, to look up to for guidance, which works perfectly with the central storyline revolving around a religious cult, similar in some ways to Scientology. Freddy turns to the Master because he is lost, because he needs someone to rein him in like a wild animal, and in some ways because he wants to know that in this crazy world, there’s someone out there who has all the answers. 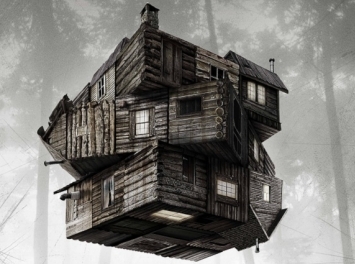 The Cabin the Woods is among the most entertaining horror films I have ever seen, a movie which manages to be a clever commentary on slasher films and the industry behind them, while also being hilarious, quotable, and ridiculously fun to watch. What strikes me most as I rewatch it, and I’ve done so four times since my initial viewing, is how well written the characters are. The screenwriters, Joss Whedon and Drew Goddard, criticize horror films in a lot of ways, and one of them is by giving us characters with believable dialogue, personal motivations, who we actually care about, making us realize how rare that is in horror these days. The film is a condemnation of the pathetic status of modern horror films, consisting of nothing but blood, guts, and naked girls, while also being a celebration of everything that makes these films fun to watch. Yes, including the blood, the guts, and the naked girls, but also the crazy monsters, the tension, and the feeling of pure terror that only a master storyteller can give us. Its third act is nothing short of brilliant as the film descends into utter madness, imploding in on itself and going places we could never possibly expect, and with one of the absolute greatest endings I have ever seen in a movie. Even more so than V/H/S, The Cabin in the Woodsreminds me of why I love horror. It may not be nominated for any awards, but for years to come, this will be considered the Holy Grail amongst horror fans, and the movie that horror directors will aspire to. It’s a blood soaked examination of the horror genre; what makes them good, what makes them bad, and what it says about us that we keep watching them. It is one of a handful of horror movies that I would, without hesitation, describe as brilliant. Movies these days are too insincere. It seems like we’ve gotten to the point where it’s impossible to express absolute, raw, honest emotion in a film without there being some layer of self-awareness or irony. Last year, I declared The Muppets my favorite film of 2011, a decision which must have seemed strange, but I stand by it. This was a movie which wore its heart on its sleeve, and was absolutely, unabashedly sincere about its silliness. There was no level of smugness, or a sense that the characters were detached from the action and winking at the camera. They danced down the street with a smile on their face singing, “life’s a happy song,” and it was impossible not to smile along. For similar reasons, Les Misérables is my favorite film of 2012, though it’s hardly as happy of a song as the one the Muppets sang about. This is a movie which is easy to mock, and many already have. It’s the same reason Titanic has been so widely made fun of since its release. These are both films which show an unabashed, old fashioned, almost Shakespearean story of love, regret, and hope, and they’re so utterly sincereabout it. Tom Hooper never feels the need to modernize the story, and in his brilliant adaptation, he crafts something which feels like it could exist, and be powerful, in any period in history. Part of the reason Les Misérables works so well is because of Hooper’s decision to have all of the actors record their songs live on set, rather than in a recording booth months prior to the actual filming. What I love about this is that in a lot of cases, Tom Hooper simply doesn’t care whether or not the song sounds good. What I mean is that it isn’t about if Anne Hathaway can give us the best sounding version of “I Dreamed a Dream,” hitting all of the perfect notes and sounding as good as she would on Broadway. Instead, what matters most is for the songs to feel real, and for the emotions to be overwhelming and raw, and everyone involved with this production really captures that intensity. Hooper’s directorial style has also been frequently criticized. He shoots many of the film’s sequences in close up, where we simply see the actor’s face on screen and barely anything else. For the iconic “I Dreamed a Dream” sequence, we spend just about the entire song watching Anne Hathaway’s face against a black background. Many have complained about this, saying the film feels claustrophobic and small, but I loved that about it. We’re being shown everything we need to see, with no unnecessary distractions, as if we are on the stage with the performers. What’s important in “I Dreamed a Dream” is Fantine’s emotions. Nothing else. 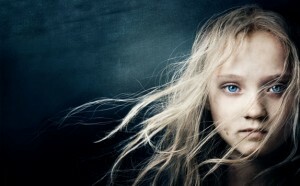 The reason Les Misérables is the best film of 2012 is perhaps most evident in Hathaway’s performance of “I Dreamed a Dream.” Towards the end, she is letting out so much raw emotion, it almost doesn’t sound like she’s singing anymore. Fantine barks out the words as she is weeping, and we are up so close we can see the tears rolling down her face. Here is a scene which could easily be mocked in one of those stupid Oscar skits or a College Humor sketch. Imagine a comedian who looks slightly like Hathaway sitting there weeping in an over the top, humorous way. My point is that rarely in movies like this do we get emotions so sincere with no level of irony. I think part of the reason is that these days, we’re so jaded and cynical that too many movies have a layer of smug insincerity to them. But not Les Misérables, which is willing to risk being mocked for being overly emotional and schmaltzy. It’s an utterly real, personal yet epic modern musical classic. Coming out of the theater, I was reminded of watching The Shawshank Redemption for the first time, another life affirming, utterly sincere classic American movie. 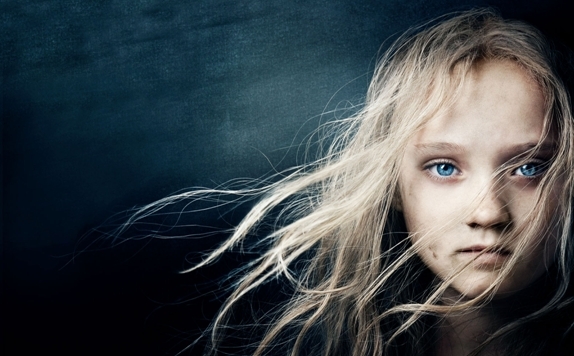 I’d be willing to bet Les Misérables will go down in the annals of film history as that one has, and if not, it sure deserves to. 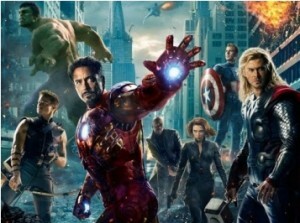 January 1, 2013 in All Movies.